The building to the north of Sandfield Bridge once provided stables for the towing horses and a house for the bridge keeper. The main structure was built by the Canal Company in 1837 to provide stabling for the towing horses near the mid-point of the canal. At the same time, the Company agreed new Bye Laws defining how many horses were needed (from one to nine depending on the size of vessel) and what the charges were to be. A group of owners based at Purton provided horses for towing up the canal, and owners based at Gloucester provided horses for the return journey. The conduct of some of the horse drivers led to complaints from ship’s masters, particularly concerning shortage of horses or delays en route. One master complained that his vessel was delayed two hours because the horses were not brought at the time ordered and the boys driving them misbehaved because their request for “grog” was refused. Another complaint arose after an attempt by a light vessel to overtake a loaded one ended in a collision. Each complaint was investigated by the Canal Co committee, and those found at fault were usually fined or banned from future employment. It was probably in the late 1850s that the house was added at the south end of the stable block to provide accommodation for John Hunt, the new man in charge of Sandfield Bridge. The previous bridge keeper had lived in a house in Whitminster Lane. Soon after Hunt moved in, however, his wife was involved in a tragic accident. One evening when he was away, she was called out to open the bridge, and in the darkness she missed her footing, fell into the canal and was drowned. The Canal Co immediately ordered that vessels navigating the canal at night must carry a good light fixed at the bow. Hunt married again and stayed at the bridge for over 30 years, but then he too had an accident when he fell into the empty hold of a vessel and died from his injuries. John Hunt was followed at the bridge by his son Thomas, then by Thomas’s son Reg and then by Reg’s wife Lil, making a continuous service by the Hunt family of over 100 years. After tugs began towing vessels along the canal in 1860, the role of the towing horses declined and the stables were no longer needed. It is not clear what the building was then used for, but there is a local tradition that the loft was occupied for a time by a sailmaker. If so, it was probably George Newman, who was living in Frampton at least between 1881 and 1901. 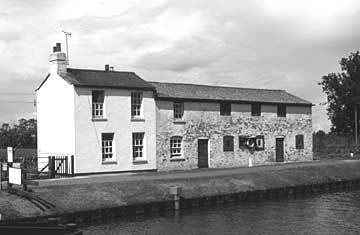 A sail loft at Sandfield Bridge would have been well placed to serve owners of vessels trading on the Stroudwater Canal as well as those having vessels built or repaired at the Junction Yard on the opposite side of the Sharpness Canal. By the middle of the twentieth century, and probably long before this, the building was just used by the bridge keeper - half as a workshop and tool store and half for keeping chickens, ducks or geese. 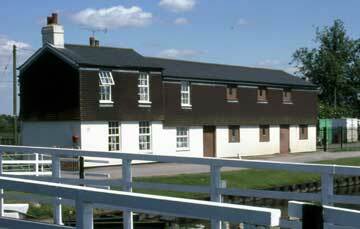 After the Hunt family moved out, the house was extended to incorporate part of the stable block, and the remaining part later became a store for the canal maintenance team. After they moved out in 2005, British Waterways obtained planning permission to convert the former stables into a café, and The Stables Cafe opened in 2008.